I had the best time serving with the young women from my church a few weeks ago. We were looking for a way to serve others in our neighborhood (and have a little fun at the same time), so we hosted a service scavenger hunt. It was a complete success! Not only did the girls have a great time, but we met new neighbors, and we got to think about others instead of about ourselves. With Thanksgiving just around the corner, it’s time to start focusing on gratitude. With the craziness of daily life, it’s easy to get caught up in ourselves and our problems and forget about our many blessings. I find that serving others is a great way to get a new perspective on life. When we help others, we often discover that our problems seem lighter. As a result, we find ourselves happier and feeling more positive about life. 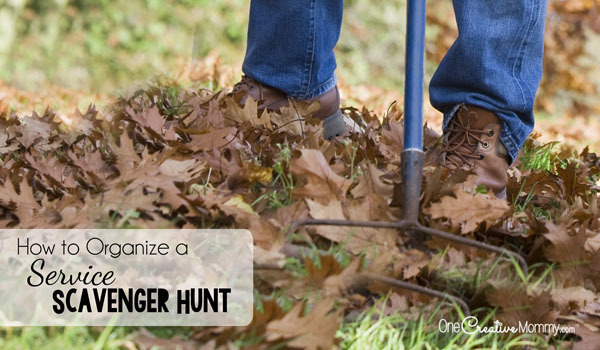 A service scavenger hunt is a fun way to get youth (or your family) out of the house and serving others. First, gather ideas for service that will work in your area. Keep in mind the safety of your kids. If the area in which you live is not very safe, plan only outdoor service, and make sure kids are well supervised. If possible, serve in an area in which you are familiar with most of the neighbors. Next, divide the jobs by difficulty, and assign a point value to each job. Finally, create a chart listing the jobs, the point value, and a place for the home owner to sign off the job. You don’t want to go to all that trouble? Don’t worry! I’m sharing my chart with you to save you the work. You can download my completed chart in pdf form or download my excel spreadsheet to edit the way you like. Now that it’s time to serve, simply divide the youth into groups (4 or 5 to a group is about right), give them some instructions about appropriate behavior in other people’s homes (don’t skip that part! ), and send them out to serve! Be sure to send a leader with each group to make sure the youth stay safe. Don’t forget to tell the youth what time they need to be back at the starting point. You can also offer bonus points to teams who pick up more youth along the way to join their team. The more the merrier! Have fun and enjoy serving! Thanks for stopping by today. While you’re here, check out more ideas by clicking on the images below. What a wonderful way to keep the focus on what truly matters most. 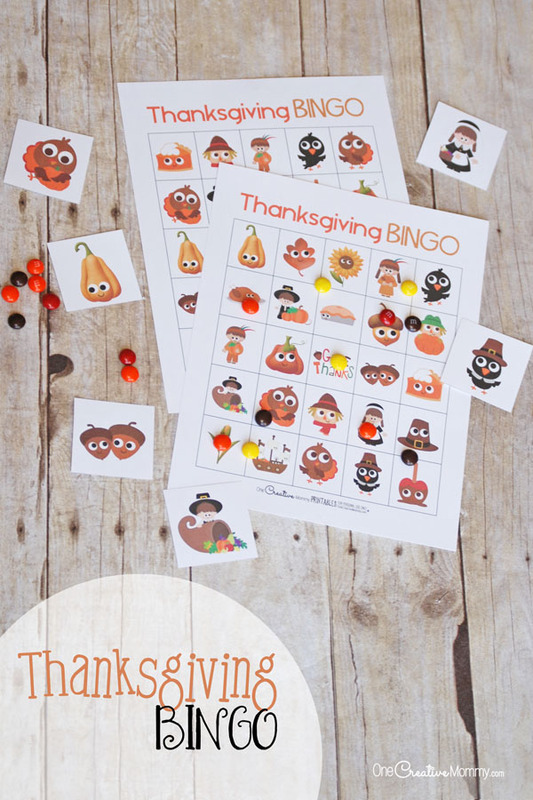 I plan to share this idea with my tween so she can pass it on to her community service club! Thanks, Marcie. What a great club! We called that Key Club in my High School. Glad to hear that there is something similar for tweens. Oh wow these are so great. Thanks for sharing!! You’re welcome, Ashley. Thanks for taking the time to comment. Have a great Thanksgiving. I love this idea. Our girls have become friends with a group of girls and boys in middle school and I somehow became the planner for finding things for the whole group. This would be great for all of them. Thanks, Kristi. Lucky you! 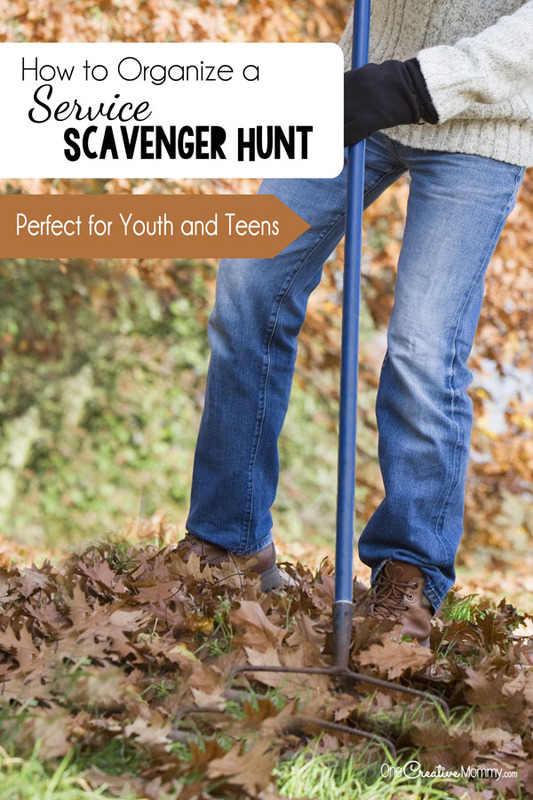 Finding activities for tweens is a tough job! Good for you for taking it on. This is brilliant! While the youth at my Church have no difficulty completing the required service hours for high school graduation, this activity would be just plain fun too! Thanks, Cathi. That is so cool that your kids have required service hours for high school graduation. I’ve never heard of that, and I think it’s an awesome idea! Kids definitely need to see and have experiences like that. It helps them appreciate their blessings and feel better about their own challenges. I love this idea so much! 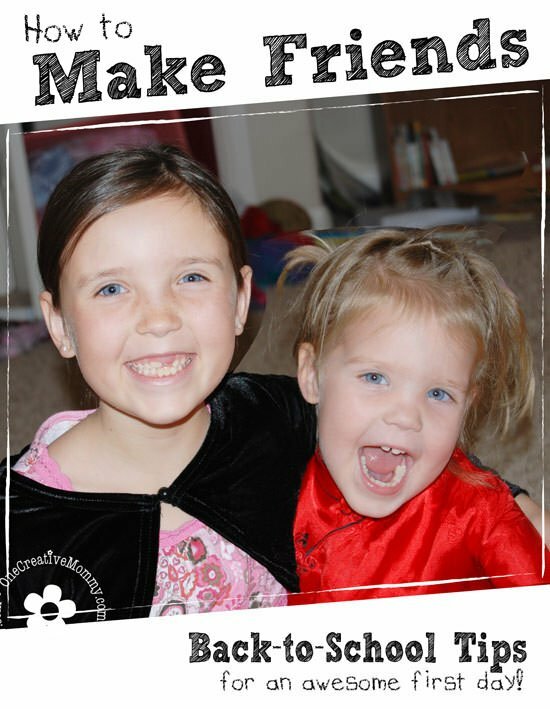 I am still trying to figure out ways to encourage my children to give and think of others. This is a way for my little ones to get used to the theme but still have fun with it. Thanks, Emily. 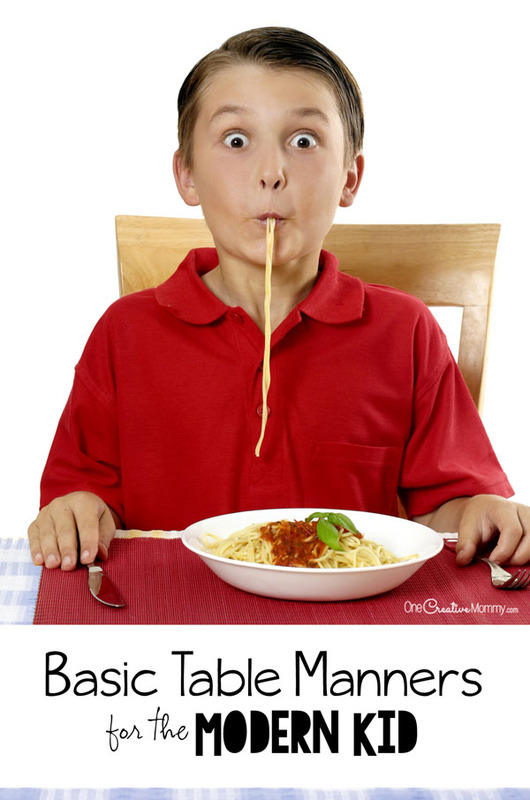 Any chance kids can have to serve–at any age–is great! I’m glad you are starting them young. I remember helping my mom take meals to people when I was little. 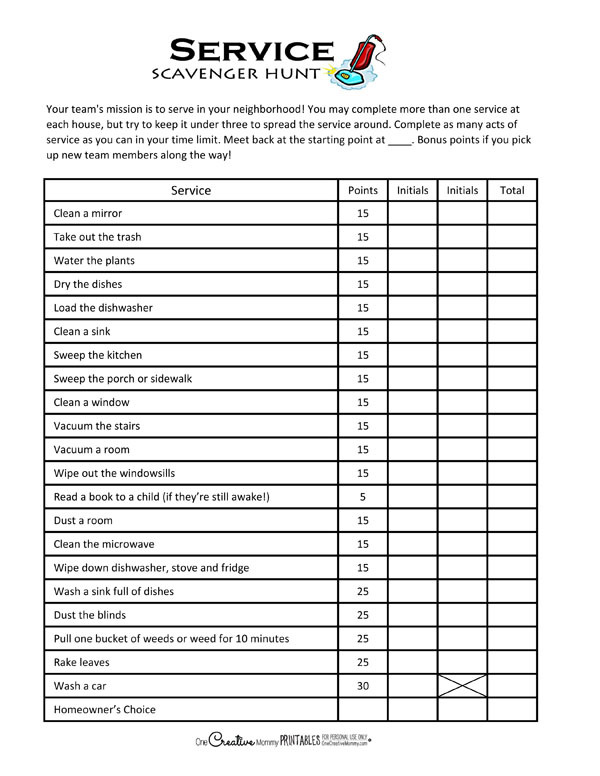 I wonder how long it would take my kids to figure out that this scavenger hunt is really a chore chart in disguise!?! Hopefully never! I’ve never heard of a service scavenger hunt before. I do believe children should learn how to help others, parrticularly be helping certain specific organizations.